Enter as Strangers. Leave as Friends. This post & beam cottage, originally commissioned by the Tillinghast family of New York City in 1873, has been our summer home for nearly 60 years. In 1982, we opened our doors to guests as Samoset-on-the-Sound and now a new generation of the family is taking our property in new directions as Arend's Beachfront Inn on Martha's Vineyard. 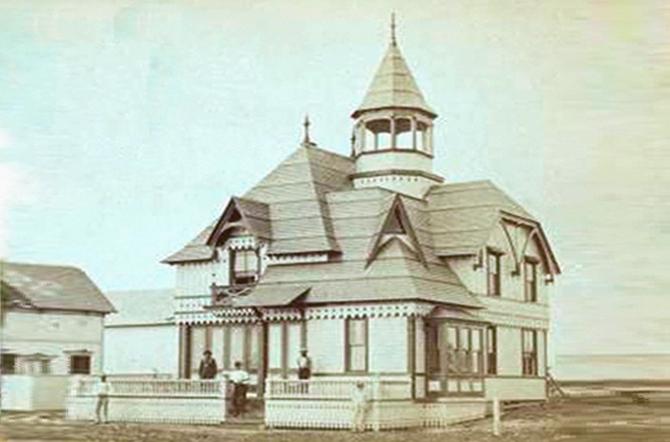 The Beachfront Inn retains the essence of famed architect Samuel Freeman Pratt's unique vision. His innovative "Bird Cage" style graces many mansions of Newport, Rhode Island and smaller, but still grand, buildings in Oak Bluffs. The popular iconic "Octagon Church" downtown and Tabernacle in the Campgrounds are Pratt designs. Intrepid guests may dare to climb the second floor spiral staircase, past accumulated antiques awaiting restoration in the attic, to the Crow's Nest observation deck for a breath-taking panoramic water view of Cape Cod & Martha's Vineyard.